Place cubed sweet potatoes & coconut oil into a gallon sized zip top bag. Shake and agitate until the sweet potatoes are lightly covered with coconut oil. 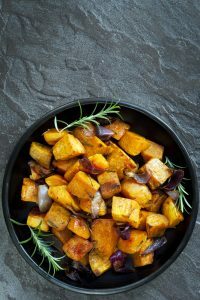 Pour oil-covered sweet potatoes into a single layer on a parchment paper lined cookie sheet (parchment paper makes cleaning EASY) and bake for 20 minutes. Pull sweet potatoes out of oven, sprinkle with sea salt and flip the potatoes.